Many locations that offer Wi-Fi service (such as coffee shops, bookstores, libraries, etc.) require some type of fee, a login process or user agreement to connect. The Nintendo DS is not compatible with these types of hotspot locations. 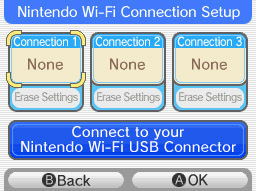 However, if the hotspot location does not require these, you may be able to connect using the Auto Search function of the Nintendo WFC settings screen. 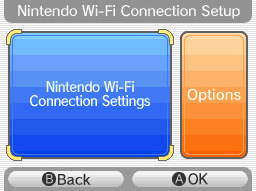 With a Wi-Fi compatible game inserted into your Nintendo DS, access the Nintendo Wi-Fi Connection Setup screen. Your game manual provides information on how to do this for the game you are playing. The Nintendo DS will then display the name of the available wireless access point(s). If the Access Point has a blue, unlocked icon, tap the Access Point name, and then 'OK.' The Nintendo DS will then establish a connection with your router. Return to the main screen of your game and you're ready to play online. It's that easy! If the Access Point has a red, locked icon, the hotspot location has WEP security enabled on its wireless router. In order to connect, the hotspot location will need to provide you with the WEP key for that Access Point. Once you have this, tap the Access Point name on the Nintendo DS and enter the WEP key for the hotspot location's router on the following screen and tap 'OK' to save the settings. Tap 'OK' again and the Nintendo DS will then establish a connection with the router. Return to the main screen. It's that easy! If the Access Point has a grey locked icon, the hotspot location's router security settings are not compatible with the Nintendo WFC. In these instances, it is not possible to establish a connection with the Nintendo WFC. Ensure the location does not require an internet browser to set up an account, acceptance of a user agreement or a password to be entered. If this site requires any of these items, the access point will appear as having incompatible security. You will need to go to a different location. 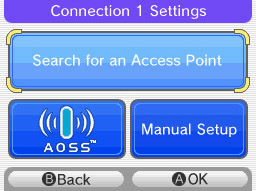 It's possible that the hotspot location's router, router settings, or access requirements are not compatible with the Nintendo DS. Checking with the location you are attempting to connect from to ensure that their Wi-Fi access is up. Moving closer to the wireless router. You may want to ask the staff at the location where the signal is strongest. Orientating the Nintendo DS so that your body or other objects (such as walls, plants, furniture, and other people) are not blocking the signal.